In early February, Reston Hospital Center announced that they were going to be the first hospital in the Mid-Atlantic region to implement the Mazor X technology for spine surgery and, just last week Dr. Lim was able to perform his first surgery with the brand new tool. Pre-Operative Analytics: A suite of software-based sophisticated tools allows surgeons to pre-operatively assess spinal alignment, implement full surgical planning and facilitating a total patient treatment strategy before entering the operating room. A key component of Pre-Op Analytics, the X-Align module, is a combination of biomechanical logic and virtual surgical tools with computerized alignment calculations that allows surgeons to streamline the process of creating a holistic alignment plan for each individual patient. Intra-Operative Guidance: During surgery, Mazor X utilizing precision mechanics and a bed-attached, bone-mounted surgical arm to guide surgical tools and synergistic implants according to the Pre-Op Analytics. This, coupled with innovative tracking and imaging, allows for a predictable and accurate execution of the surgical plan. Real-Time 3D Verification: The Mazor X System’s real-time verification allows surgeons to close the surgical loop and confirm – execution and reconciliation of the surgical plan using proprietary 2D fluoroscopy-based technology, visual tracking, or intraoperative imaging systems. This allows surgeons to keep their incision sites smaller while still allowing them to see everything they need to in order to successfully complete the operation. Smaller incisions mean less blood loss, less tissue and muscle damage and shorter recovery periods. 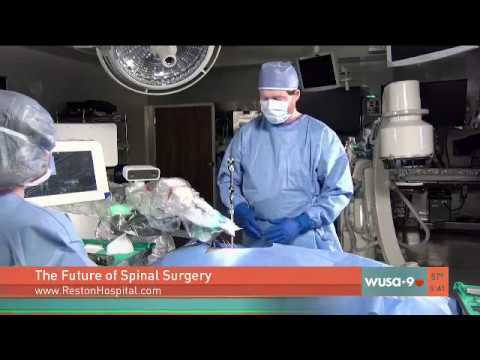 Dr. Lim is one of the few surgeons in the Virginia area trained in robotic spine surgery. Using Robotic Guidance reduces the need for intraop x-rays and also reduces radiation exposure for patients and OR staff. It eliminates the error caused by the human hand and reduces procedure time once the learning curve is overcome. And minimally invasive techniques benefit the patient greatly: there are smaller incisions, minimized scarring, shorter hospital stays, less postoperative pain and faster recovery times. 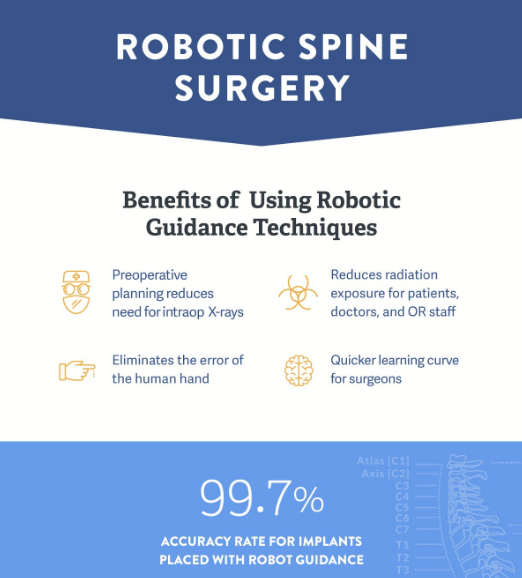 If you would like to more about Robotic Spine Surgery, explore our infographic to learn about the technology and its benefits.